The 39th Mideast Watch & Jewellery Show will bring together some of the world’s best jewellers and jewellery designers at one place, the organisers said. Media reports reveal gold’s biggest price decline in over five years has boosted buying interest among customers across the GCC region. “The sharp decline in gold prices has definitely generated interest among buyers of gold and diamond jewellery. And, if the prices stay low and fluctuate less, the Mideast Watch & Jewellery Show will be a real delight for jewellery buyers,” said Saif Mohammed Al Midfa, CEO, Expo Centre Sharjah. The show will be held under the patronage of HH Dr Sheikh Sultan Bin Mohammed Al Qassimi, Supreme Council Member and Ruler of Sharjah. The price of gold has dropped to as low as $1,082.27 an ounce while a broadly strengthening dollar has kept a lid on prices as the currency has an inverse relation with gold. The diamond price too has lost its glitter a bit in the first half of the year, and the industry, until recently one of the very few to escape a trend of falling commodity prices, has seen rough diamond prices tumbling 3.4 per cent in the period, the organisers observed. Prices for the precious stones have fallen 9.4 per cent in the past year, they quoted the recently launched Zimnisky Global Rough Diamond Price Index as saying. “In response to growing market demand, and anticipating better consumer response due to low gold prices, Mideast Watch & Jewellery will be bigger and better this time. The show will fully occupy all the six halls at Expo Centre Sharjah at 30,000 sq m, as against the past edition’s 20,000 sq m.
Connoisseurs will be excited to know that they can find gold and diamond jewellery from across the world brought exclusively for them by more than 500 exhibitors,” said Al Midfa. “Moreover, it will also be a curtain raiser to the landmark 40th edition of the Mideast Watch & Jewellery Show scheduled to be held at the Expo Centre from April 5 to 9, 2016,” he added. The October event will showcase gold and diamond jewellery, diamonds, precious stones, pearls and watches from leading jewellers based in Bahrain, Brazil, China, Egypt, Hong Kong, India, Italy, Japan, Jordan, Lebanon, Lithuania, Malaysia, Pakistan, Saudi Arabia, Singapore, Thailand, Turkey, the UAE, UK, USA and Yemen. 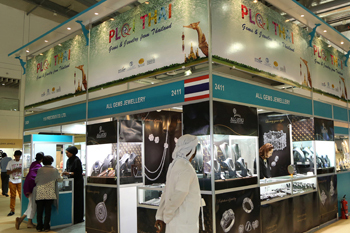 Visitors can look forward to special deals on high-value purchases, national pavilions from India, Hong Kong, Thailand, Singapore and Italy, and customisation opportunities, it was highlighted. A special attraction will be the daily raffle draw, a coupon for every purchase of Dh500 ($136.12). The Hong Kong Pavilion will also give away prizes to visitors. Timings are 12 noon to 10 pm daily, except Friday, October 9 when it opens from 4 to 10 pm. There will be an exclusive ladies-only session from 12 noon to 4 pm on Wednesday October 7. Admission is free.